Some would call it an omen. 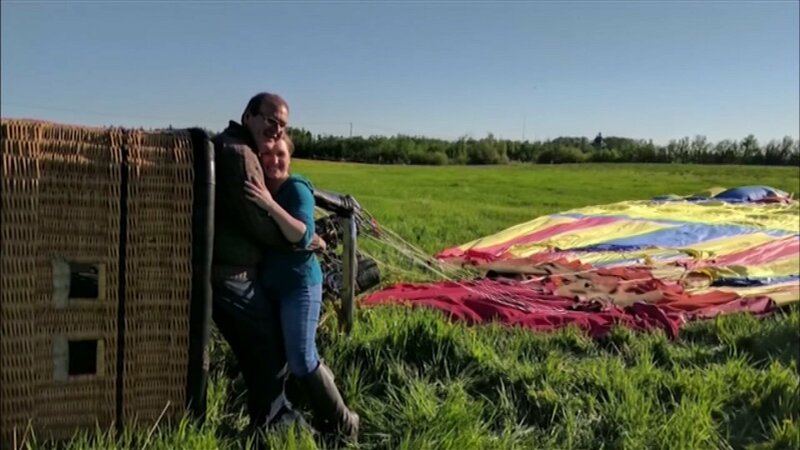 A picturesque marriage proposal nearly ended in disaster this weekend in Canada when a hot air balloon crashed moments after a man popped the question. Stephen Martin took his girlfriend Christine Peters on a ride she wanted to do since she was a child. Moments after she said yes to his proposal, the balloon began to experience trouble. "We're coming down and we're coming down quickly," Peters said. The couple were in the balloon basket with 10 other passengers and a pilot. One of the passengers, Jeffrey Scott, captured the terrifying ordeal on video. "It happened so quick that I don't think anyone was really terrified or scared," Scott said. The pilot told everyone to brace themselves as they floated over a farmer's field near Edmonton. "Then all of a sudden, we're still 30 or 40 feet up in the air, and just the whole thing shakes and you hear like, cracking of branches, and we're in a tree," Peters said. The balloon went down, hitting two trees, before landing in a field, where it slowly tipped over. No one was hurt beyond a broken nail. "Seeing as how I proposed to her, it makes for an awesome story," Martin said.